There is one simple rule about submitting your manuscript: Do as the publisher requests. Please refer to the instructions to authors or similar information on the journal's website and follow the instructions exactly as requested. For example, see the checklist for manuscript submission from the American Psychological Association. A key element to submitting a manuscript is the cover letter as that's your opportunity to engage the editor's attention in your work. See "Writing cover letters for scientific manuscripts" for good information and tips on how to craft a noteworthy cover letter. Please also note the links to sample cover letters in the "Learn more" box on the right-hand side of this page. Once you have submitted your manuscript, your waiting process then begins. It isn't unusual to wait many weeks or months before hearing back from the editor, so don't be discouraged if you don't receive an immediate response. Also, once you hear from the editor, if your article has been accepted for submission, it's standard practice that minor or major edits will first be required by the editor. 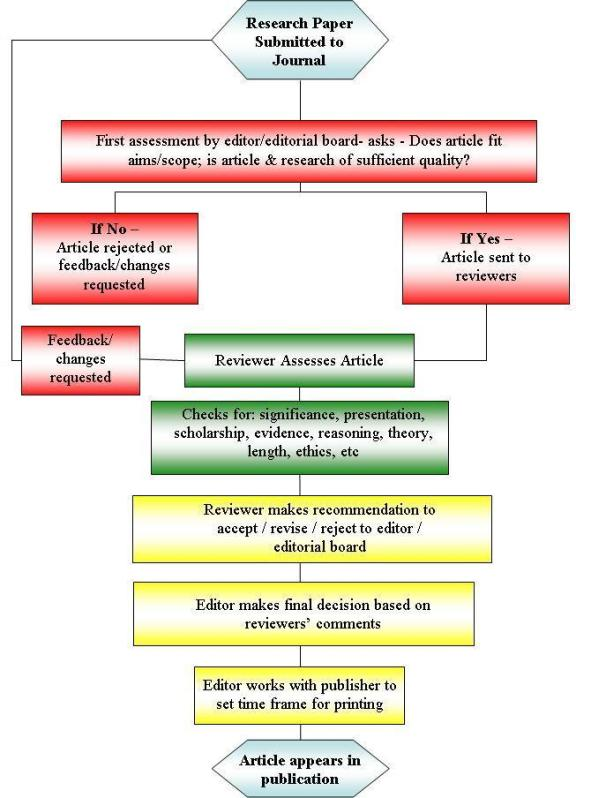 For more information on the peer review process, please see the information provided in the module titled "Good to great: The editorial and peer review process". Image published at https://www.elsevier.com/reviewers/what-is-peer-review , © Elsevier 2013. Image used with copyright permission granted from Elsevier; image may not be re-used without obtaining copyright permission from Elsevier. From Taylor & Francis, which is a major UK publisher. "Peer review: Behind the scenes"
Information on the peer review process from Taylor & Francis, which is a publisher of scholarly work. "How to make your article anonymous, ready for peer review"
If you are submitting a manuscript to a double-blind peer review process, see these instructions from Taylor & Francis on how to prepare your document. Advice from Dr. Theresa MacPhail in the Chronicle of Higher Education's "Vitae" on how to respond to criticism during the peer-review process. Advice from Dr. Theresa MacPhail in the Chronicle of Higher Education's "Vitae" on how to understand reviewers' comments when in the peer review process. "Should you skip revise and resubmit?" Advice from Karen Kelsky in the Chronicle of Higher Education's "Vitae" re: why seeing through the revise and resubmit process is worth the time and effort. "From the journal editor's vantage point"
Kristen Bell provides an academic journal editor's perspective on the revise-and-resubmit process (via the Chronicle of Higher Education's "Vitae"). "Techniques for easier and faster revisions"
Advice from Dr. Theresa MacPhail in the Chronicle of Higher Education's "Vitae" on how to streamline the revision process. "Responding to a journal's decision to reject"
Excerpt from "Writing your journal article in 12 weeks: A guide to academic publishing success" by Dr. Wendy Belcher. Requires RRU username and password to access. "Take the hit and move forward"
Advice from the Chronicle of Higher Education on how to respond when a manuscript is rejected.